I first had methi fish at my friend Jyoti’s house. I loved the flavor of methi (fenugreek) in the dish and fish simmered in this methi gravy tasted awesome. 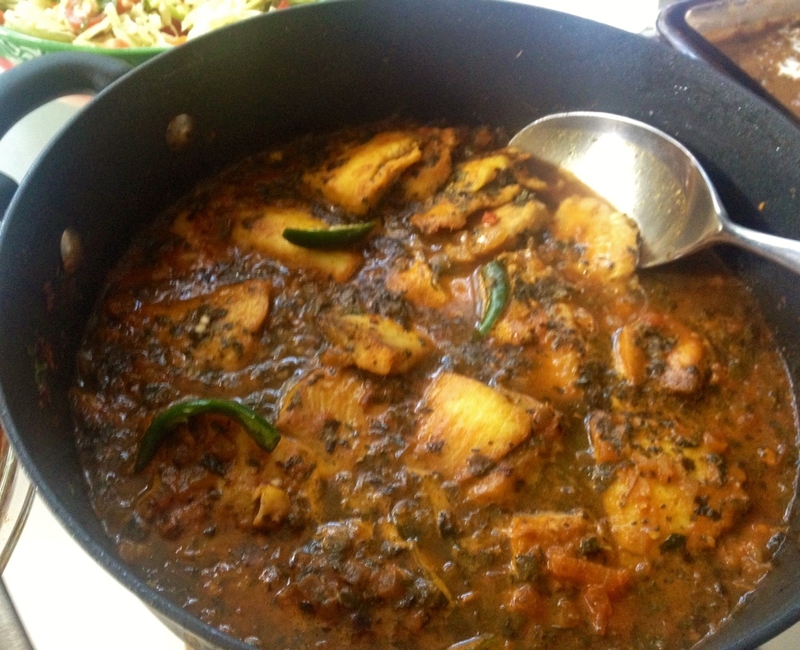 I served this fish curry to my friends for lunch and they loved it. Methi seeds and leaves are widely used in Indian kitchens and has many health benefits. Methi contains protein, fiber, vitamin C, niacin, potassium, iron and alkaloids. It helps in reducing cholesterol, aids digestion, is a remedy for cough and bronchitis and also helps diabetic patients. 1. Wash and dry the fish fillets. Rub turmeric on the fish and keep aside for 10 mins. Soak the dry fenugreek (kasuri methi) in water. 2. Heat oil in a pan and lightly fry the fish on both sides. Remove from pan and keep aside. 3. To the hot oil in the pan, add the methi(fenugreek) seeds and let them splutter. You can remove the fenugreek seeds from the oil and discard it, but I skip this stage, as we liked the fish curry along with the seeds. 4. Now add the finely chopped onions and fry till the color changes to light pink. Now add the ginger garlic paste and saute for another couple of minutes. 5. Add the kasuri methi (after draining out the water) and the chopped coriander(cilantro)leaves and stir well. Add the chopped tomatoes and the green chillis to the pan now and mix well. Add the chilli powder, salt and coriander powder and cook till the oil separates. 6. Add 1 cup of water and bring the whole gravy to a boil. Once it starts boiling, add the fish fillets. Cover it and let it cook on low heat for 5-7 minutes. 7. Serve hot with rice. Enjoy! I used this recipe yesterday – it was really delicious.